A power of attorney can be revoked at any time for any reason, as long as the principal is mentally competent. An incapacitated or incompetent principal cannot revoke a durable P.O.A. In these cases, is likely that will be court proceedings, where a judge determines whether or not the principal is competent to revoke the document. An existing Power Of Attorney will remain in effect until the expiration date, if included, or until the person granting the POA revokes it. Your complete physical address and phone number. 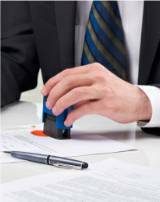 This free revoke power of attorney sample is for personal use and to be used as a guide only. I,_______________________(Principal's name), of ________________(Principal's Street Address), city of _________________________, County of __________________________, State of ____________________________, hereby revoke the power of attorney dated __________________, 20___ given to, and empowering ____________________________ __________________ (name of Attorney-in-Fact) to act in my behalf as my true and lawful attorney in order to handle my financial affairs and health care decisions should I become incapacitated and not be able to do so myself, and I declare that all power and authority granted under said of power of attorney is hereby revoked and withdrawn. IN WITNESS WHEREOF, I, a notary Public of the State of ______________, duly commissioned and sworn, have hereunto set my hand and affixed my official seal in the _________________ County of _______________________ on this date of _________________, 20____. When revoking an existing Power of attorney without naming a new representative, you must attach a copy of the previously executed POA. On the copy of the previously executed Power of attorney, write “REVOKE” across the top of the document. Then, initial and date it again under your signature. NOTE: The law is constantly changing. In order to make sure the information found on this website will accurately reflect the specifics of your legal case and comply with the laws in your state, consult a licensed attorney near you who can advise and assist on the preparation of all or any customized legal documents you may need. STATES: Alabama - Arkansas - Alaska - Arizona - California - Colorado - Delaware - Connecticut - Florida - Georgia - Hawaii - Indiana - Illinois - Iowa - Idaho - Kansas - Kentucky - Louisiana - Maine - Maryland - Massachusetts - Michigan - Minnesota - Mississippi - Missouri - Montana - Nebraska - Nevada - New Hampshire - New Jersey - New Mexico - New York - North Carolina - North Dakota - Ohio - Oklahoma - Oregon - Pennsylvania - Rhode Island - South Carolina - South Dakota - Tennessee - Texas - Utah - Vermont - Virginia - Washington - West Virginia - Wisconsin - and Wyoming. Return from Revoke Power of Attorney to Home page. Copyright © 2017 USAttorneyLegalServices.com - Revoke Power of Attorney - All Rights Reserved.